Cowboy and Southwestern styles live outside the On/Off cycle of most interior decor trends. While the overall popularity may come and go, there are fans that live the lifestyle not the trend. Those who love the old west, the american prairies and deserts are happy to know that their passion has hit a resurgence over the past few years and there's no sign of it waining. By other names, the Navajo, Aztec, Native, Tribal and even Gaucho (from Spain) influence has resulted in a refresh of cowboy and southwest living design. 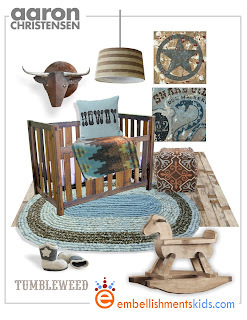 For children's rooms and nurseries, the classic cowboy look has evolved to include reclaimed woods, faux taxidermy and a less is more modern feel. Wandering outside of the strict cowboy theme, there's the addition of bears,wolves, camp out and USA traveler rolling into the western icon palette. Patterns like native geometry, bows and feathers, cow skulls and even dream catchers are all the rage in children's and teen fashion and are popping up in home dec. I've recently added some new wall art to my portfolio. It explores these themes. The group is designed for the home decor market but a few pieces cross over well into my kid theme design stick. 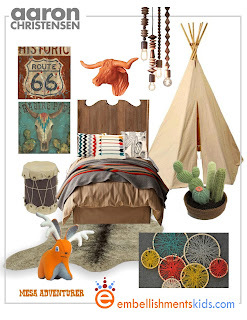 Southwest Influence Adventurer Boy's Room Mood Board featuring Aaron Christensen's wall art. Over on Pinterest I've also created a board exploring the trendier side of the theme with some DIY's, inspirational pictures and links to fun west by southwest goodies.